Small business owners in the process of starting or updating their internet marketing efforts have choices to make when it comes to owning vs. renting a Content Management System. This article is third in a series covering the pros and cons of website ownership and leasing options. While aimed at our clients in the bed & breakfast, dude ranch and related hospitality industries, the information presented here will shed valuable light on the subject for any small business. When it comes to websites, a Content Management System (CMS for short) is the software platform where the business and/or its service providers manage the website visitor experience, including on-page text, images and oftentimes other data such as a shopping cart. Open source CMS is generally the closest the small business can come to fully owning their website. The top open source Content Management Systems are licensed to users for free and each offers its own set of features, functions and both free and paid licensed add-ons. WordPress currently holds nearly 60% of the CMS market share and the reason is simple: it is easiest for the beginner to learn. It is also typically the best option for small to medium-sized business websites, blogs and smaller online stores. Joomla has about 6.5% of the CMS market and is best suited for medium to large e-commerce or social networking website. It requires at least a moderate understanding of relevant technical skills, so it’s not the best choice for beginners, whether taking a DIY approach or working with a professional web design company. Drupal holds about a 5% share of the CMS market and is geared toward high to expert skilled website developers, as it requires a deep level of understanding of HTML, CSS and PHP coding. This is the least friendly option for beginner CMS users. Several proprietary Content Management Systems offer a lot of enticing features, easy-to-use administrative interfaces and tools, and powerful database management. Many are oriented to specific industries. All of them are owned by their developers and cannot be moved to other hosting environments as is. Technical support for exporting content and data vary, so it’s critical that the business shopping for a licensed solution understand what they can take with them and how difficult and/or costly the migration would be. The following a couple of popular Licensed CMS providers and their stated level of technical support for exporting content. You can export certain content from your Squarespace site into an .xml file. This is useful if you want to export content into WordPress. So the question would be “what content” is exportable? It isn’t readily apparent from their online support so it would be crucial to discuss this with a representative. Weebly is popular with businesses just starting their online marketing. It’s very easy to use, but is it easy to export a Weebly site to take it to a different CMS when you’re ready to upgrade to a more powerful platform? In WPbeginner’s “How to Properly Move from Weebly to WordPress” a total of six major steps and dozens of minor steps in the process – possibly a proper move, but hardly easy, especially for the technically challenged. And the above are among the “best case” scenarios with licensed CMS in most cases. We know our clients in the B&B, dude ranch and distinctive lodging markets are busy folks. They want an easy-to-learn CMS and WordPress wins that hands-down among the top open source providers. They also want a CMS that is powerful enough to handle their data efficiently and present their marketing message effectively and WordPress handily ticks off those checkboxes. 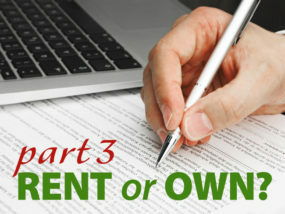 Back to the question of Rent vs. Own? The reality is that the question has become somewhat out of date. A better question for today: is it transportable – can the site you invest in transport to another host? The answer is YES! Content, photos, and the database could all be uploaded into another WordPress theme and function, but the site wouldn’t have the exact custom design or features we build for clients, those take server side plugins and security to ensure everything works seamlessly. As security needs increase, developing server-side solutions has become more important. The server is the engine that makes the website go. As developers it’s impossible to develop secure tools and plugins without control of the hosting environment. Truly owning a stand alone CMS site that follows all web developer rules and ensures security isn’t a reality without a secure hosting environment controlled by the developer of the product. Contact us to learn whether our combination of WordPress-based design and managed hosting is right for your business website.